You could write in Gandhi? But yeah. This reminds me of the Europeans who say that Obama would be on the far right of the far right party in their countries. Almost dead center in the middle. A lot of those questions sucked though. I have to agree or disagree with questions I don’t have opinions on or I don’t think are valid questions. Makes me angry every time I do tests like this. p.s. — I just now realized I made an error when typing the post: the Friedman mentioned should be MILTON, not Thomas (though I think Thomas is close to Milton anyway). Dunno why I didn’t catch that earlier. I’m closest to Gandhi. Who knew? Where in relation to Gandhi? Looking at this again, there are so many interesting connections to draw. Like Alan Keyes being closer than anyone to Hitler. Or Stalin and Ghandi sharing more in common with each other than with the entirety of mainstream US politics. I think when I first took the test I was almost perfectly in the middle left/right but about your level on the up/down. 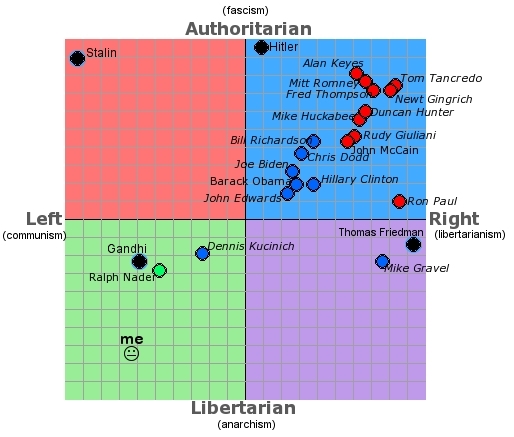 Since then I’ve shifted to about a Kucinich level left. I love Ron Paul. LOVE HIM.